MOSCOW, November 26 /TASS/. Reports that Russian warplanes have allegedly hit a Syrian relief convoy, which was on its way from Turkey, is speculation, Russian Defense Ministry Spokesperson Major General Igor Konashenkov told journalists on Thursday. “Foreign media reports that Russian warplanes have allegedly destroyed a column of trucks from an ‘aid convoy’, which was on its way from Turkey, near the Bab el Salam border crossing are speculation,” the major general said. 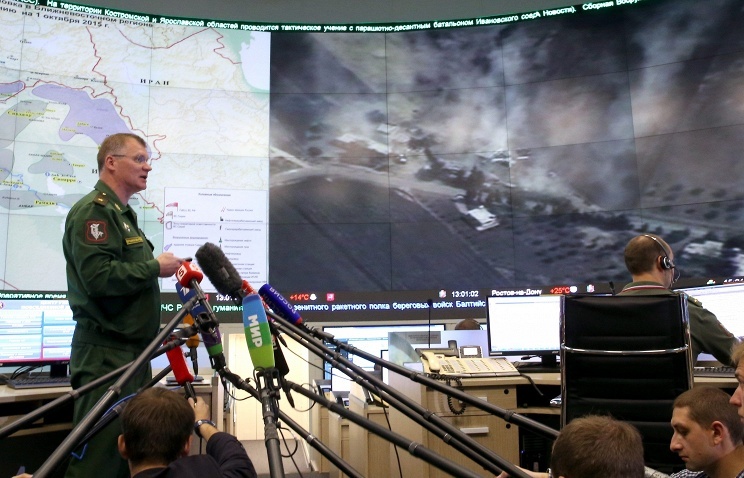 Konashenkov drew the journalists’ attention to the fact that the photos and video materials from the scene did not show any craters from explosions and no splinters which were supposed to have cut all the trucks subject to the shelling and bombardment. “Finally, nothing was left of those ammunitions. Therefore, we would recommend you not to try to pass off a burning truck convoy with munitions meant for the militants operating to the north of Aleppo as relief aid next time,” the Russian general said. “The Turkish side never notified anybody that it was planning to send a relief convoy. Let alone, that any aid convoy should have special identification marks,” he added.